Anglers who receive the commendation of Expert Angler are renowned for their angling specialization. To establish a standing as a lifetime “Expert,” anglers must document their fishing skills by landing and registering 10 trophy-size fish (see trophy fish chart) of the same species. When an angler accomplishes this he/she is recognized as a lifetime Expert Angler for that species. 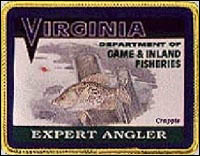 The angler receives a species-specific patch and a certificate. There is no separate application to fill out. Our computers count the number and type of trophy fish each angler registers and flags us when someone qualifies as an expert. Expert Angler Awards are available for all 23 freshwater species in the program.